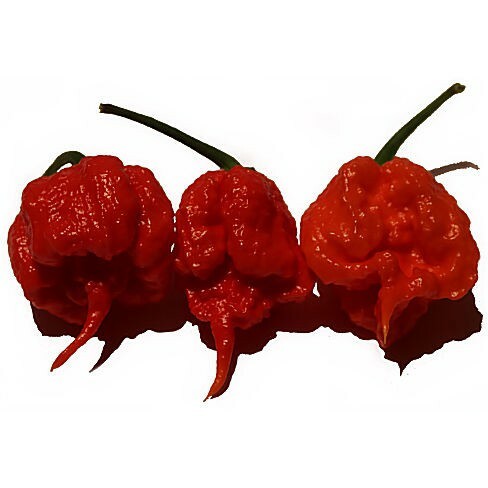 Hot pepper Borg 9 Red is a crossbreed between the Naglah and a bubblegum 7 Pot. This hybrid is developed by Jon Harper. The crossbreeding is still realy unstable. This pepper is named after the deceased actor Ernest Borgine. This very hot pepper can be used in sambals, peppersauces and in all dishes that needs some spice. Hot pepper Borg 9 Red ripens from green to red. Non hardy annual. Sow indoors from January on. Sow in trays or individual pots filled with moist potting soil. Cover the trays with a lid and the pots with clingfilm. Sow the seeds shallow - max. ½ cm deep and cover them lightly with some soil. Sow the seeds shallow - max. ½ cm deep in good sowing soil and cover them lightly. Use a spray bottle to water the seeds, so you don't disturb them. Keep the soil moist but don't let it get to wet. When you can pinch water out of the soil, then it's too wet. Keep moist, but not wet to prevent the seeds from molding. Keep the temperature as even as possible and don't let the temperature drop during the night. Soak the seeds in tepid water approx. 12 hours prior to sowing. This softens the seeds and let them germinate better. As soon as the seedlings emerge remove the lid or clingfilm. Transplant the seedlings to individuals pots about a couple of weeks after germination. Put them in very deep pots to give the roots enough space. The root system of hot peppers is very delicate, so you must be very carefull with it. Put the seedlings in a warm, sunny and sheltered spot. Preferably in a greenhouse or a hothouse. Outdoor sowing is possible from the middle of May, when there's no longer any danger of frosts. Sow on a very sunny plot with freedraining soil. Thin the seedlings, when they're large enough to handle, to 60 cm apart. Hot pepper varieties crossbreed easily. So when you want to harvest the seeds, it's important to keep them apart from each other. Give the plants some liquid fertilizer when the fruits start to develop. Use the liquid fertilizer each week. You can harvest you hot peppers by cutting the fruits of the plants with a pair of scissors.